In the course of reading about the brain, I realized that the role the limbic system plays in our daily lives (and has played in mine) is often underestimated. The limbic system is the collective name for a complex of fibers and gray matter (neurons/cells) that relay and interpret emotional information to the neo-cortex above and the reptilian brain below. On the side of caution, however, the cells in the limbic system get fooled when people become addicted to hard drugs. At first, these chemicals of abuse produce an intense pleasurable reaction, but ultimately, they flood the receptors of the cells to which they attach, and in the process, destroy them. The tragic result is that the addicted person can't experience pleasure again, either naturally or chemically. 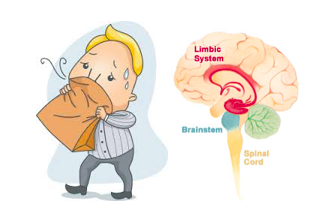 An over-reactive limbic system is the current explanation for episodes of panic and anxiety. For example, Mr. N., a Broadway star, was about to perform for a famous conductor when he suddenly forgot the lyrics. "I knew every word before I got on stage, " he said. Such is the power of the limbic system that can stymie us at significant moments. The good news is that the reaction is temporary. Grasping the thought behind the panic can liberate a person from his brain chains. Getting lost on a road trip causes me to panic. By contrast, my brother views losing his way as an adventure. Reframing my thoughts to regard getting lost as adventure, not disaster, lessens my anxiety and I'm more likely to find my way. Conclusion: Feelings and emotions that motivate or paralyze us lie within the limbic system. Our awareness that our emotional life colors our performance can liberate us from some brain chains.